Featuring the ONLY propulsion system with dual hydraulic propellers mounted side-by-side, TruSwim® swim spas offer the widest swim path spanning a full 29” with a resistance current ideal for all types of aquatic fitness and swim routines. Our dual propeller driven water is pushed through a unique honeycomb grate assuring an even and smooth, yet powerful resistance path. Delivering nearly 5,000 gallons per minute, the adjustable TruSwim® current is ideal for all ages and fitness. The unique sidewall and bullnose end construction of the TruSwim® swim spa shell ensures the exercise path remains even and uninterrupted from start to finish. Splitting the return current evenly, the bullnose design creates a natural path along the smooth sidewalls to the return grates for an unobstructed swim path with a more balanced resistance. 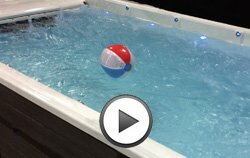 Video below uses a ball to follow smooth water flow. Swim spa designs with any type of curve or obstruction in the sidewall may look appealing, but will lack performance as the return path mixes with the resistance flow when it bounces off the side curves, causing counter waves and splash. The fitness lane becomes a turbulent mix of water in every direction hampering the effectiveness of aquatic exercise. Exercise becomes difficult as there is not a balanced, smooth resistance current only a mix of water movement in all directions. With four designs in the TruSwim® line-up, there is one right for you and your home. Our space-saving 15’ model is a great solution for compact spaces, such as a porch, garage or small yard. The 17’ and 19’ models offer ample room to move, swim and play indoors or out. The unique TSX219 dual zone model features a fitness zone measuring 14’ and a full size 5 seat hot tub. 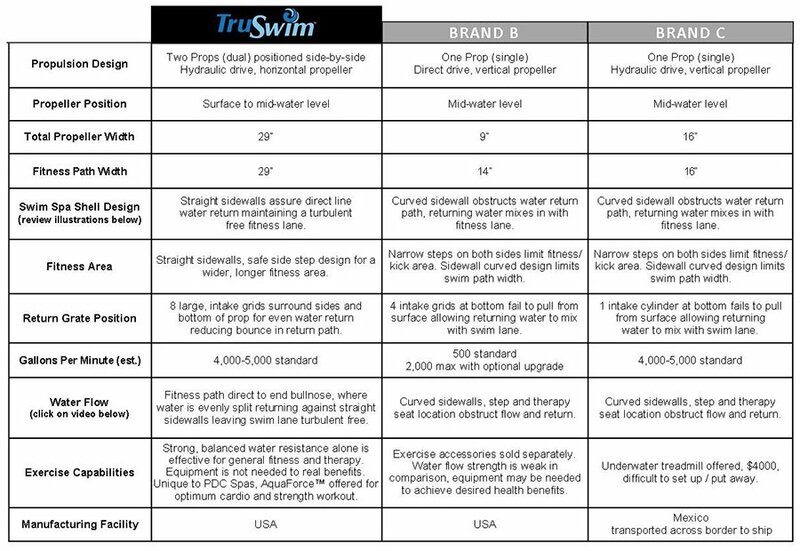 Watch the video here for a sample of the many fitness options with TruSwim®. Every spa is meticulously engineered to combine performance, energy efficiency and comfort features for a high quality, luxurious spa that will provide years of enjoyment and satisfaction. A leader in the spa industry, our innovative hot tub and swim spa designs include energy saving, patent pending performance and hydrotherapy technology that will enhance your spa experience and exceed your expectations for years to come.